There's even a music room stocked with guitars! 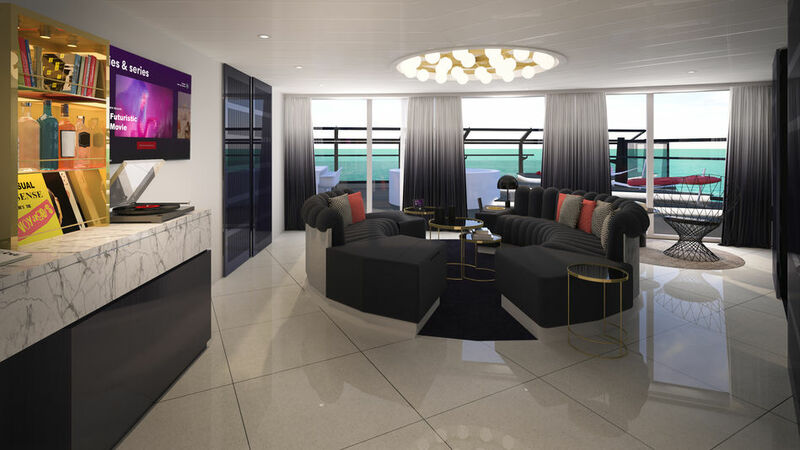 Virgin Voyages has revealed details of its new RockStar Suites on board the new Scarlet Lady cruise ship. 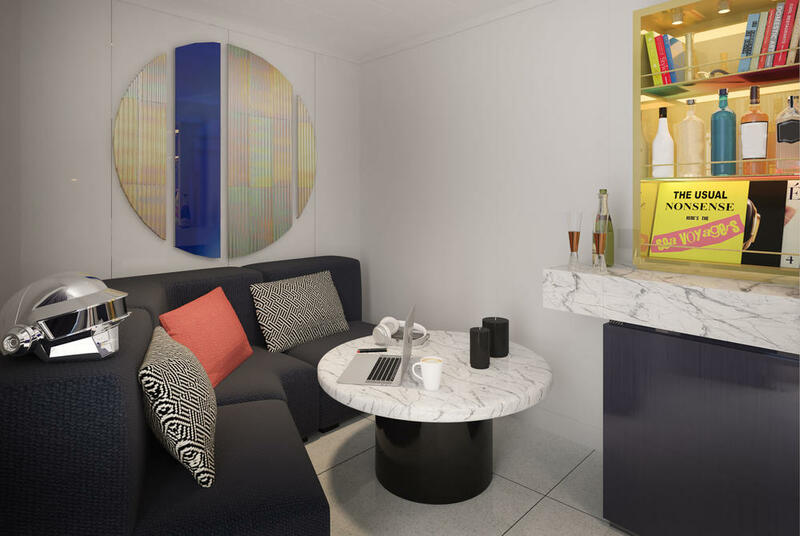 Pushing their Rebellious Luxe tagline, the RockStar Suites will be designed by Tom Dixon’s Design Research Studio. View our gallery above (tap for larger images) and view our videos below and see for yourself. The Mega RockStar Suites are named the Massive Suites, Fab Suites, Posh Suites, Cheeky Corner Suites, Seriously Suite and Gorgeous Suites. 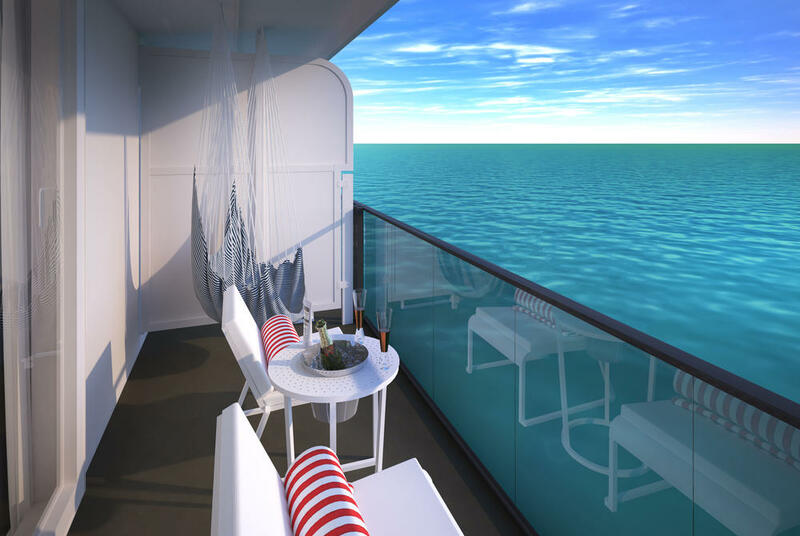 There are only two Massive Suites aboard the Scarlet Lady, with each suite located above the ship’s bridge. 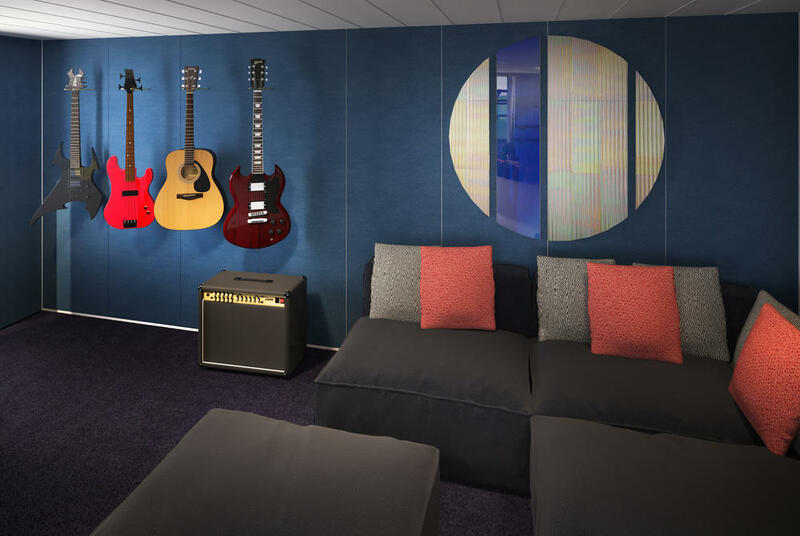 Measuring 2,147 square foot, the Massive Suites come with their very own music room stocked with guitars and an amplifier that also doubles up as a second bedroom. An oversized circular sofa is situated in the centre of the suite, along with an in-room bar set up. 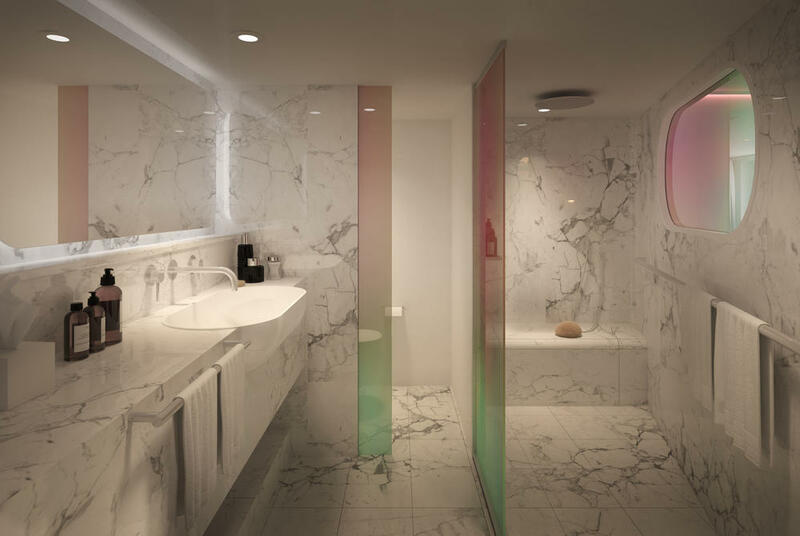 The Massive Suite bathroom doesn’t disappoint either, featuring two full-sized wardrobes, a hot tub, vanity area, and a marble-clad bathroom. 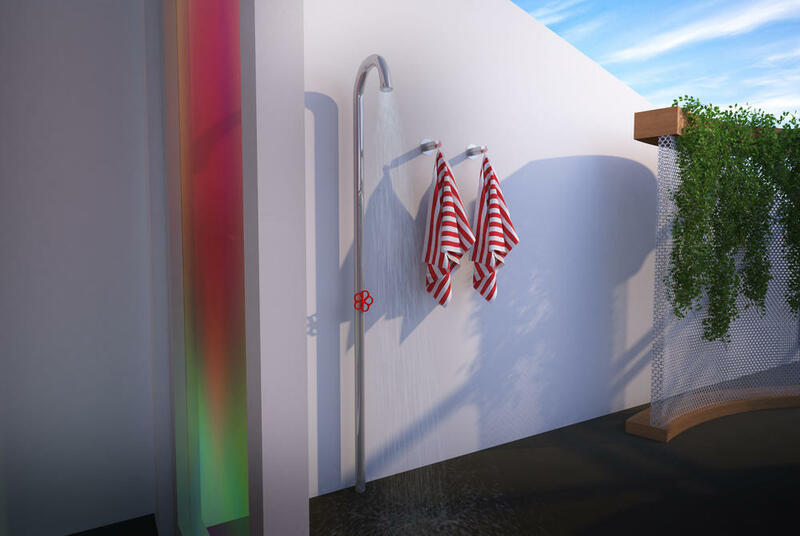 A novel feature is the Peek-a-Boo shower area that overlooks the bedroom and out to the ocean. Outdoors a huge veranda or terrace features another hot-tub, outdoor shower, loungers and hammocks. There is also a table with a staircase on it to allow for table top dancing. 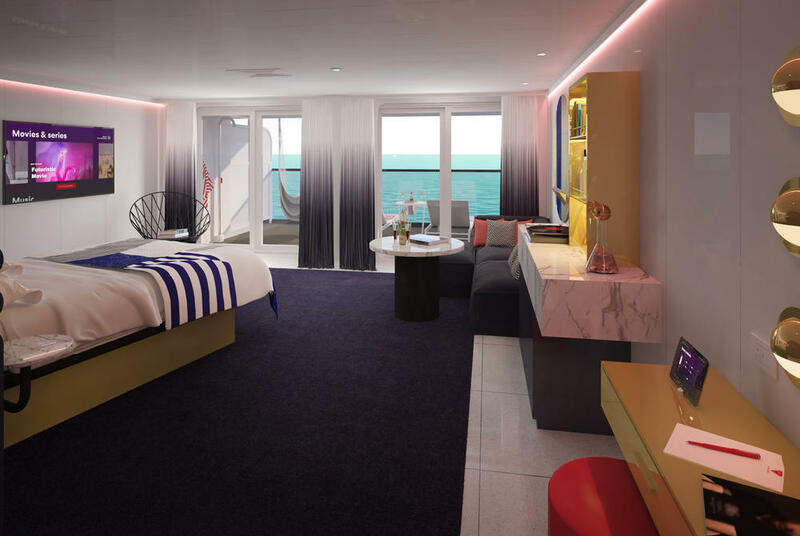 Virgin Voyages’ RockStar Suites bring a fresh look to yachting glamour style heralding back to Virgin brand’s rock and roll heritage. 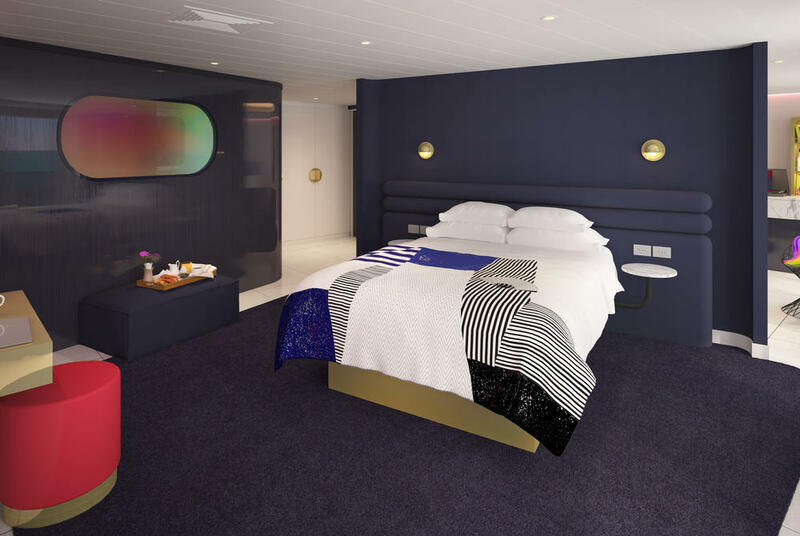 Inspired by mega yachts and rock and roll style icons, the RockStar Suites feature Tom Dixon’s iconic retro-futurism designs with a palette of deep blues used with iridescent elements to echo the colours of the sky and sea when sailing. 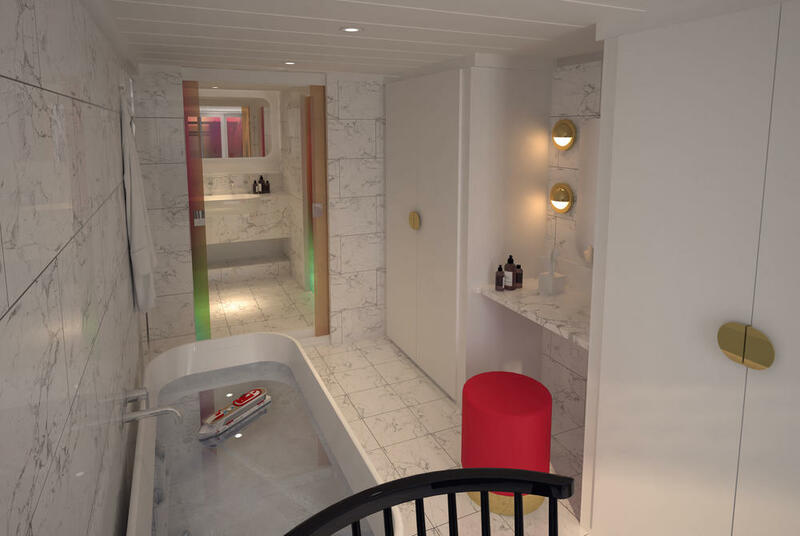 The suite’s design features nautical touches with a brass beauty counter and bedhead lighting. The modern suites boast high-quality design elements and bespoke Tom Dixon furniture pieces. Because music is the soundtrack to the soul, each suite is equipped with a vinyl turntable. Because a rockstar can never have too much champagne, the sea terrace for each suite will feature a specially-designed champagne table where an ice bucket fits perfectly at the centre of the table situated next to stargazing loungers, and Yellow Leaf brand, sustainably sourced terrace hammocks. 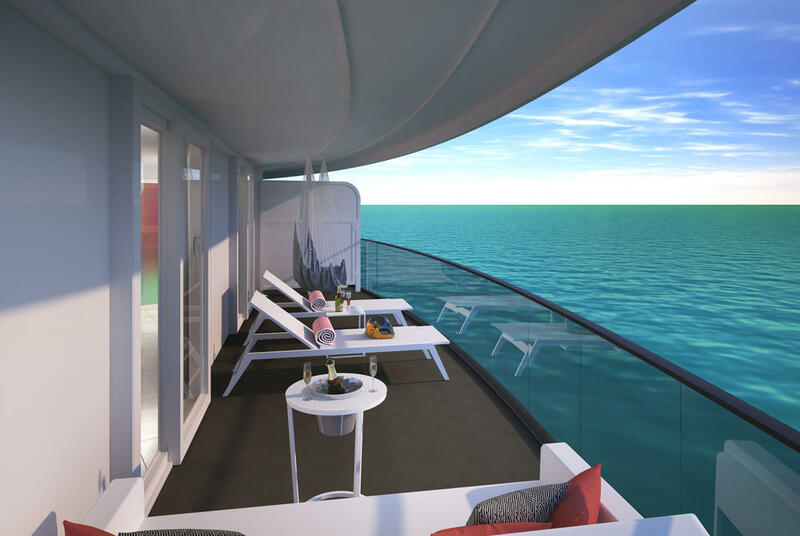 “We were intrigued to be appointed to rethink some of the most interesting spaces on this ship. A very rare opportunity to delve into a completely new escapist realm,” said Tom Dixon of Design Research Studio. 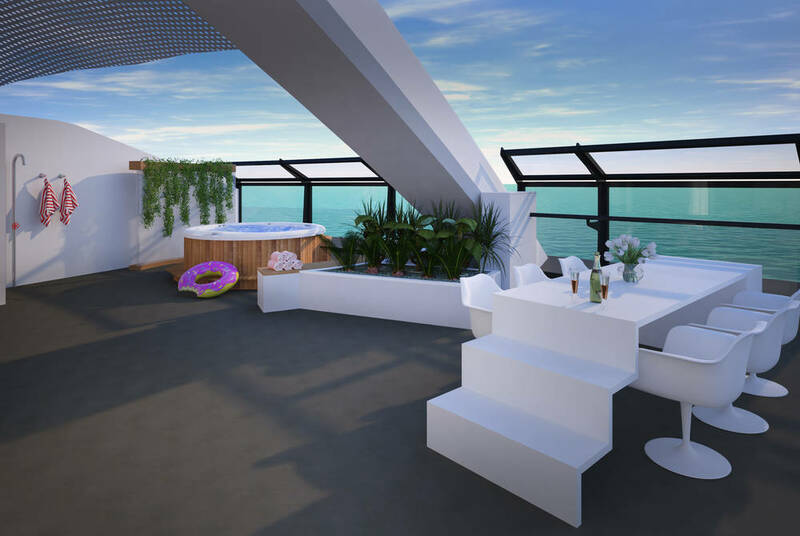 RockStar Suites Sailors will have the services of the RockStar Services Crew, from time of booking, to sail away and throughout their cruise. 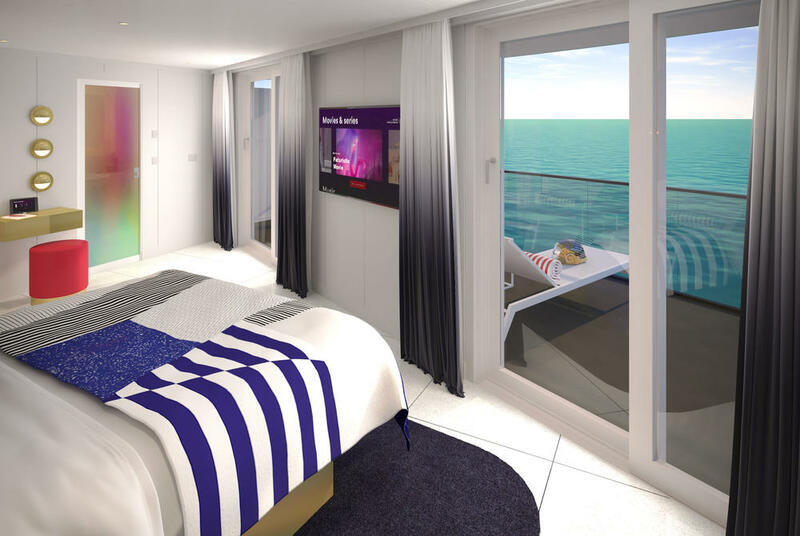 All suites are smart cabins, with mood lighting that automatically adjusts to match the time of day and in room tablets that allow sailors to adjust the room’s lighting. 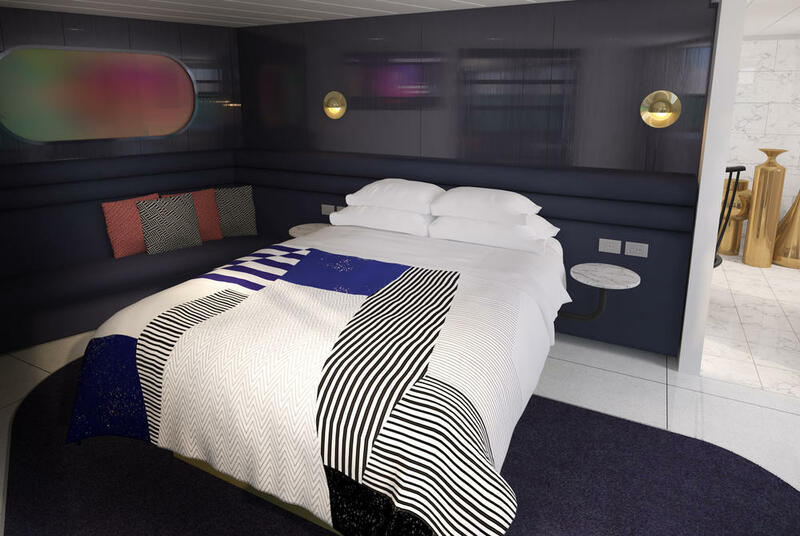 Sailors will enjoy luxurious comforts like premium linens and a plush European king bed in every suite as well as upgraded bath amenities for pampering. 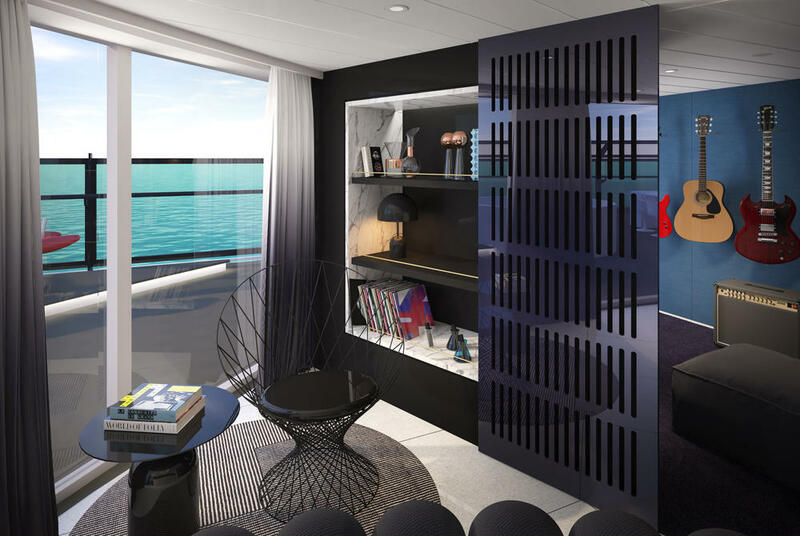 Sailors looking to go a step further can book one of the Scarlet Lady’s Mega RockStar Suites, located on deck 15. 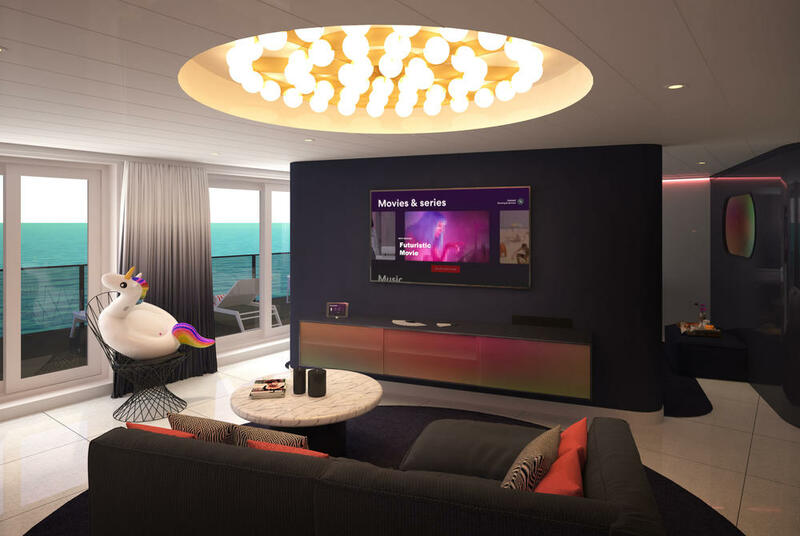 Mega RockStar Suites will receive a personalised bar filled with their favourites, and the RockStar Services Crew will tend to their rockstar rider list, sourcing whatever their heart may desire to make their voyage perfect. 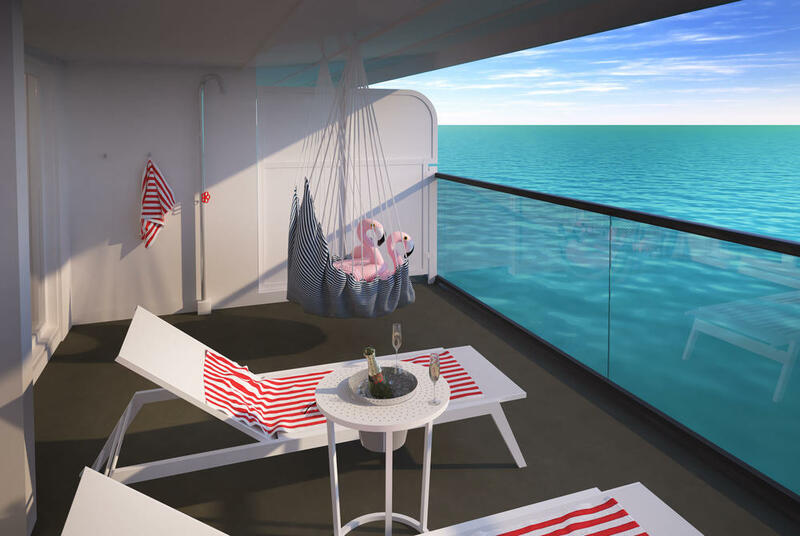 With its inaugural season scheduled for 2020, Virgin Voyages’ first ship the Scarlet Lady was designed to reflect a yacht’s sleek luxury. 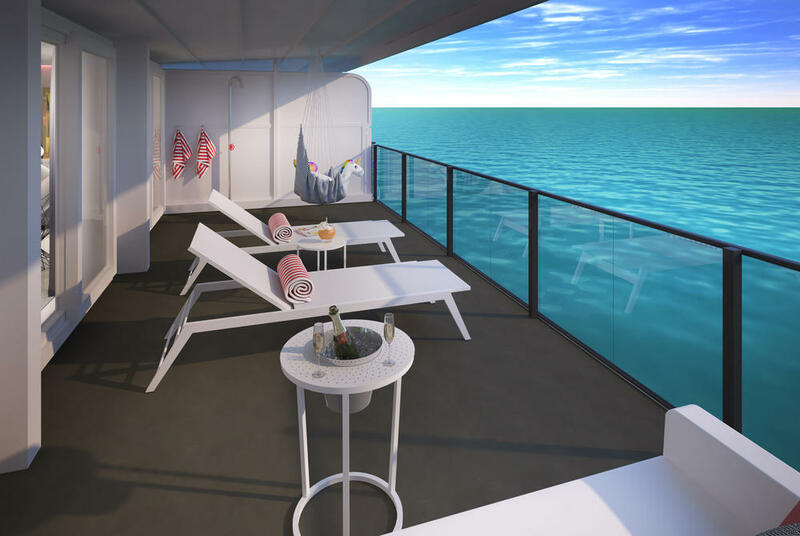 Featuring spaces designed by some of the top names in contemporary interiors, the Scarlet Lady will be Adult-by-Design, a sanctuary at sea for the 18+ traveller. 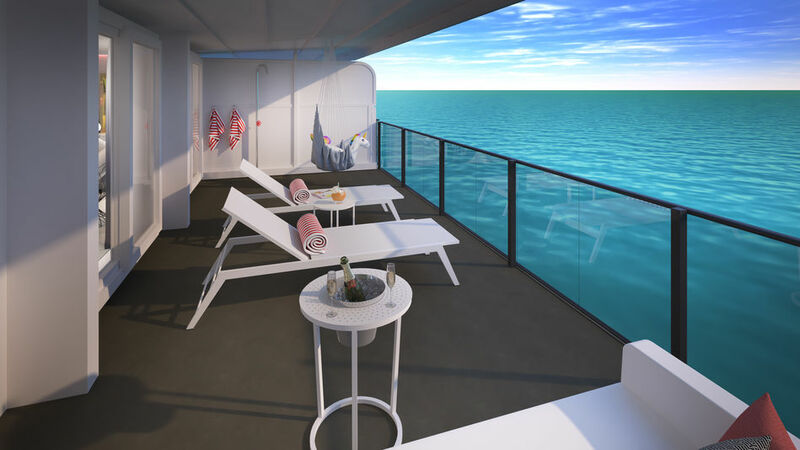 A dose of ‘Vitamin Sea’ will be naturally intertwined across the entire ship, with well-being activated through a mix of high-energy moments coupled with relaxation and rejuvenation. The Scarlet Lady will also feature alluring entertainment and 20+ world-class intimate eateries on board. 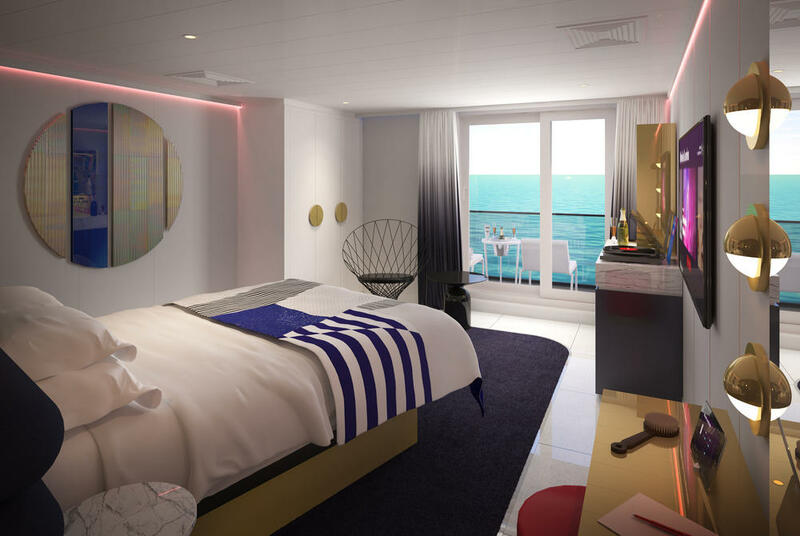 Putting a twist on luxury, which the company refers to as Rebellious Luxe, Virgin Voyages will offer incredible value for its sailors with all restaurants, group fitness classes, soft drinks, and many more Virgin surprises included within the voyage fare. The Scarlet Lady will sail from Miami to the Caribbean in 2020.